Granola Bars are nothing but aka Granola baked and cut into different shapes, so that one can enjoy them during any given time of the day. 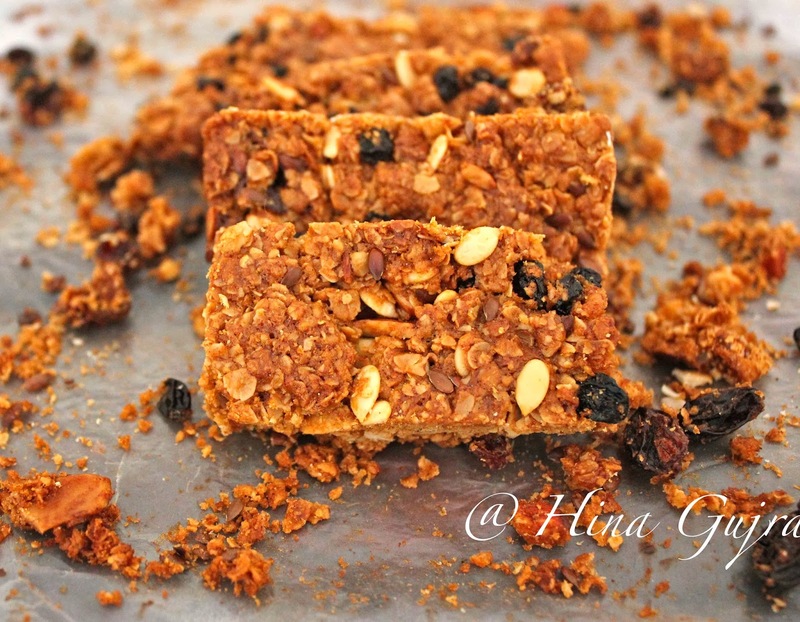 Granola Bars are the powerhouse of energy that’s why it is preferred by those who are hiking, trekking or camping because it is lightweight, high in calories, and easy to store though simple Granola can also be enjoyed as a cereal with a glass of milk or coffee but again that can be done only in the morning sitting on your dining table. 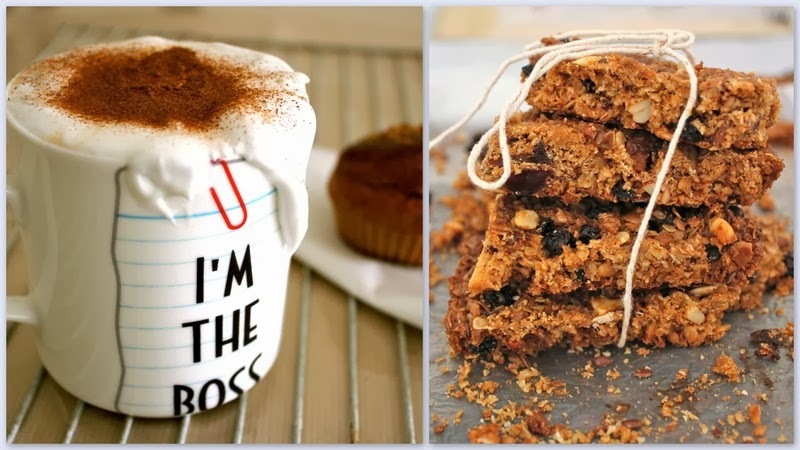 I am ashamed to say that I am not a breakfast person, I know it is totally unhealthy but my mornings are so full of hustle that by the time I am done with all the chores the clock ticks 11 O Clock, so for me quick energy bites like Granola Bars, Muesli, Cornflakes are must have items in my kitchen. 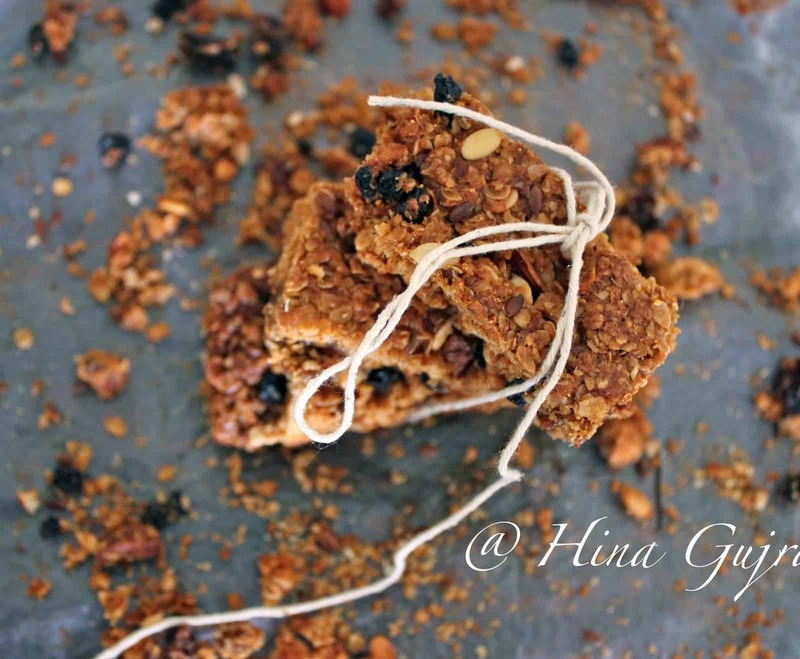 I tried couple of readymade good brands Granola Bars but I was not very much pleased with the taste, so finally I decided to bake one for myself. Though ‘He’ is not a huge fan of Cereal in breakfast so I slip Granola Bar into his lunchbox and he relishes it with coffee at office. 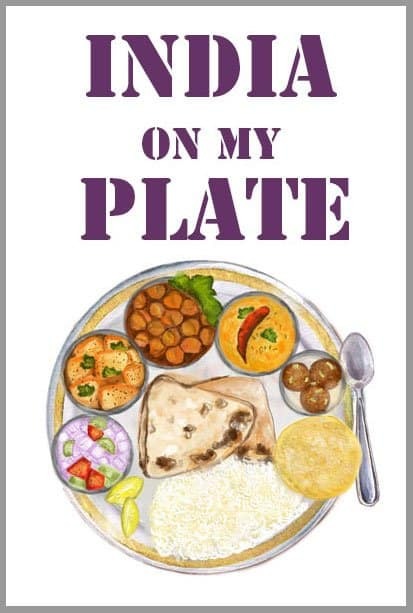 Talking about the ingredients, it is good to use old-fashioned rolled oats as they are thick in texture but even if you are using regular breakfast oats there is no change in taste. Sometimes, if I am too lazy to chop nuts and berries then I use packaged Muesli that has dried fruits, nuts and berries. 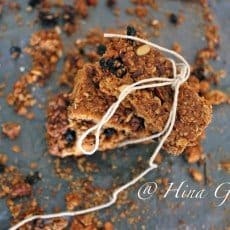 Granola Bar is like making your own customized Sub at Subway, you can use variety of dry fruits, nuts, and berries as per your liking and enjoy all of them in one bite. 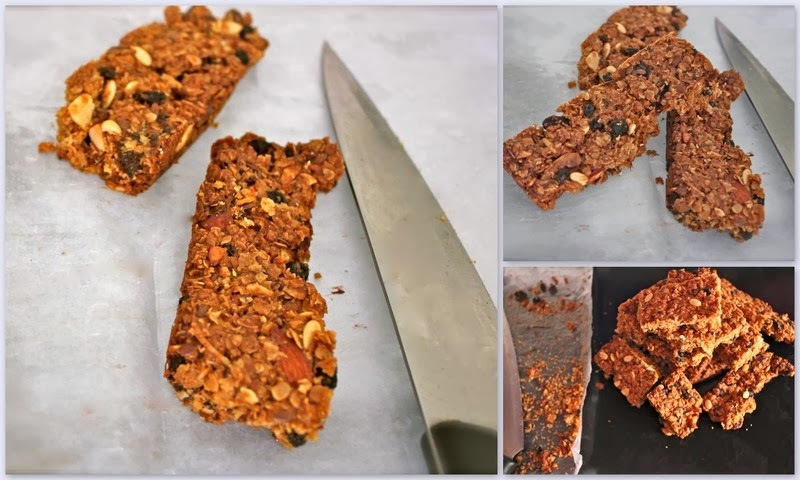 For little crisper and less chewy Granola Bars bake them for a longer duration but for 25 minutes is enough to get perfect texture Granola Bars. 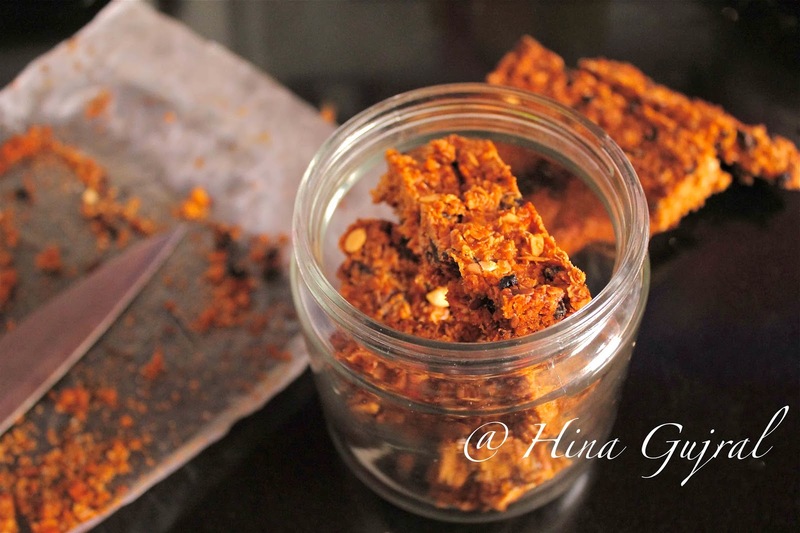 Once they come out of the oven smell is really tempting and luring but you need to control you fingers from digging into hot Granola as it can only be cut down once it is completely cool at room temperature otherwise bars will crumble while cutting into pieces, it takes around 2 – 3 hours. Granola Bars are nothing but aka Granola baked and cut into different shapes, so that one can enjoy them during any given time of the day. Grease and line with parchment paper a 9 x 13 inch (23 x 33 cm) baking pan. Set aside. In a large bowl mix together the oats, coconut and almonds. Transfer to a baking sheet and bake for about 12 -15 minutes, or until lightly browned, stirring occasionally or toss in a hot pan for few minutes until slightly brown. Keep aside. Transfer the oat mixture to a large mixing bowl. Stir in the seeds, dried berries, figs, dates, salt, and cinnamon. Melt the butter, brown sugar, honey, and vanilla in a small saucepan, placed over medium heat. Once the sugar mixture comes to a boil, reduce heat and simmer for a couple of minutes, stirring occasionally to prevent it from burning. Remove the saucepan from the heat and pour over the oat mixture. With a large spoon or spatula, stir the mixture, making sure all the dry ingredients are completely coated with the butter mixture. 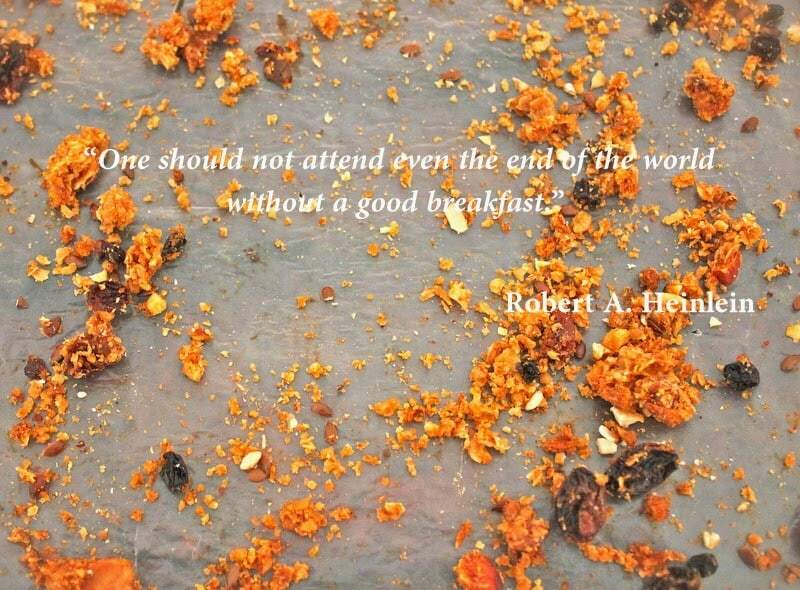 Pour the granola into the prepared pan and, with damp hands, lightly press the granola evenly into the pan. Preheat oven to 350 degrees F (177 degrees C) and place the rack in the center of the oven. Bake for about 18 – 25 minutes, or until set. Remove from the oven and let cool for about two hours before cutting into bars. Store in clean airtight container at room temperature.